Jammu is one of the 3 regions comprised by india’s north most state of Jammu & Kashmir. Also called as the City of Temples, Jammu borders Kashmir, the disputed part of the state, to the north, Ladakh to the east, and Himachal Pradesh to the south. Sandwiched between the Vale of Kashmir to the north and the Daman Koh Plains to the south, the Shivalik Range comprises most of the region of Jammu. The Pir Panjal Range, the Trikuta Hills and the low-lying Tawi River basin add beauty and diversity to the terrain of Jammu. Jammu, also known as “City of Temples”, has innumerable temples and shrines, with glittering ‘shikhars’ soaring into the sky, dot the city’s skyline, creating the ambience of a holy and peaceful city. Home to some of the most popular Hindu shrines, such as Vaishno Devi, Jammu is one of the most famous pilgrimage tourism destinations in India. Once a seat of the Dogra Rajput dynasty, Jammu came under the control of Maharaja Ranjit Singh Ji in the 19 century and became a part of the Sikh Empire. Maharaja Ranjit Singh soon appointed Gulab Singh Ji the ruler of Jammu. After the death of Maharaja Ranjit Singh, Punjab, The Sikh Empire was defeated by the British after Maharaja Duleep Singh was taken by the British to England under the orders of The Company. Not having the resources to occupy the hills immediately after annexing parts of Punjab, the British recognized Maharaja Gulab Singh, the strongest ruler north of the Sutlej River, as ruler of Jammu and Kashmir. But for this he had to pay a sum of Rs. 75 Lakhs in cash—this payment being legal as the Maharaja was a former vassal of the Sikh Empire and was partly responsible for its treaty obligations. Maharaja Gulab Singh is thus credited as the founder of Jammu and Kashmir. Jammu enjoys the status of an administrative division within the state of Jammu and Kashmir. 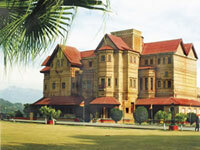 Jammu city, the largest city in the region, is the winter capital of Jammu and Kashmir. The majority of Jammu’s 2.7 million population practices Hinduism, while Islam and Sikhism enjoy a strong cultural heritage in the region. Amongst the temples in Jammu, the Raghunath Mandir takes pride of place being situated right in the heart of the city. It consists of a cluster of temples and is the largest temple complex in northern India. Its inner sanctums contain gigantic statues of deities and numerous ‘lingams’. It contains representatives of almost the entire Hindu pantheon, which make it a rare site to behold. The famous temple of Bawey Wali Mata is inside the Bahu Fort where, every Tuesday and Sunday, pilgrims throng to worship the goddess. A little further away, on a spur opposite the Bahu Fort, overlooking the river Tawi, stands a temple dedicated to Mahamaya, a Dogra heroine who lost her life fourteen centuries ago fighting foreign invaders. The Peer Kho cave temple overlooking the Tawi river, the Panchbakhtar temple and the Ranbireshwar temple are the other well known Shiva temples in Jammu. Each has its own legend, its devotees and specific days of worship. In Ranbireshwar Temple, there are twelve Shiva ‘lingams’ of crystal measuring 12″ to 18″ and galleries with thousands of ‘saligrams’ fixed on stone slabs. 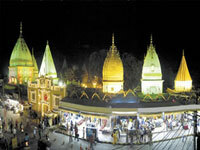 Other important temples in Jammu are the Lakshmi Narayan temple, Duda Dhari temple and the Panj Mandir in Gandhi Nagar. Ghareeb Nath – both saints were famous for their prophecies and miracles. ‘Mitha’ means ‘the sweet one’, for the Peer would accept nothing more than a pinch of sugar in offering from his devotees. On request tour of the places can be easily arranged.